Size of this preview: 800 × 539 pixels. Other resolutions: 320 × 215 pixels | 640 × 431 pixels | 1,024 × 689 pixels | 1,200 × 808 pixels. Seattle vs. Green Bay • December 27, 2009 at Lambeau Field in Green Bay, Wisconsin. 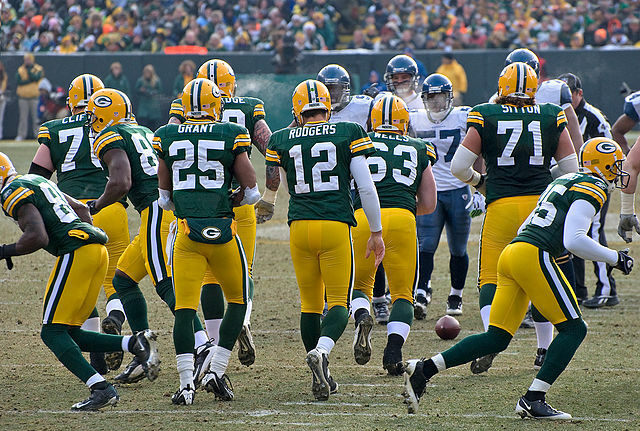 Source Flickr: Quarterback Aaron Rodgers (12) and the Packers break the huddle. This image, which was originally posted to Flickr, was uploaded to Commons using Flickr upload bot on 18 October 2012, 17:09 by Moe Epsilon. On that date, it was confirmed to be licensed under the terms of the license indicated.